Earlier, Instagram had a restricted API which didn't allow any third party app like SocialPilot to directly publish posts on it. Now that they have removed these restrictions, SocialPilot is in the process of getting extended API access. Meanwhile, SocialPilot enables you to schedule your Instagram posts with its mobile app. SocialPilot has come up with push notifications and Insta reminders for your Instagram posts. You'll receive a push notification for your post exactly when you have scheduled it for. Log into your SocialPilot account. Once you connect it on your web, please make sure you install the SocialPilot App on your mobile phone - Android | iOS . 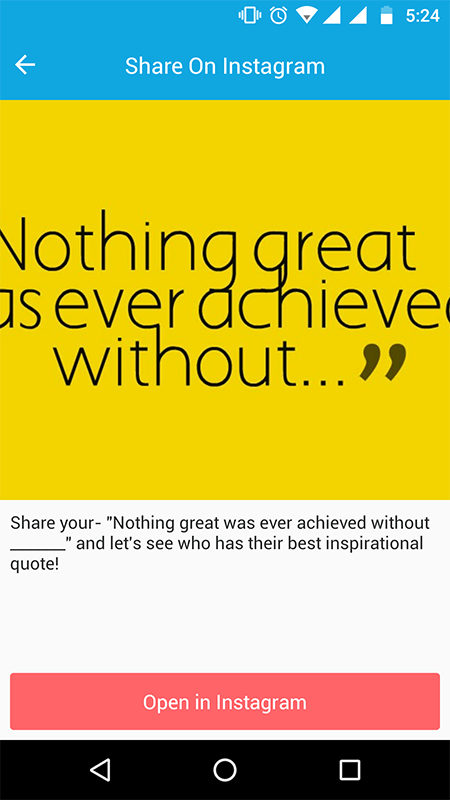 Click on 'Posts' -> Create Post for your Instagram account. Click on the Camera icon to upload an image from your computer or to share an image with its URL. Select your Instagram account and click on the 'Add to Queue button' or use any other scheduling options. Note: Please make sure you are logged into your SocialPilot account on your mobile phone (the same account you used to create this post) in order to receive notifications. How do Insta reminders work? You'll receive a push notification on your phone on the time you scheduled the post for. Note: Please make sure you have all the notifications 'on' for SocialPilot app. Also, make sure you are logged into the correct Instagram account beforehand. 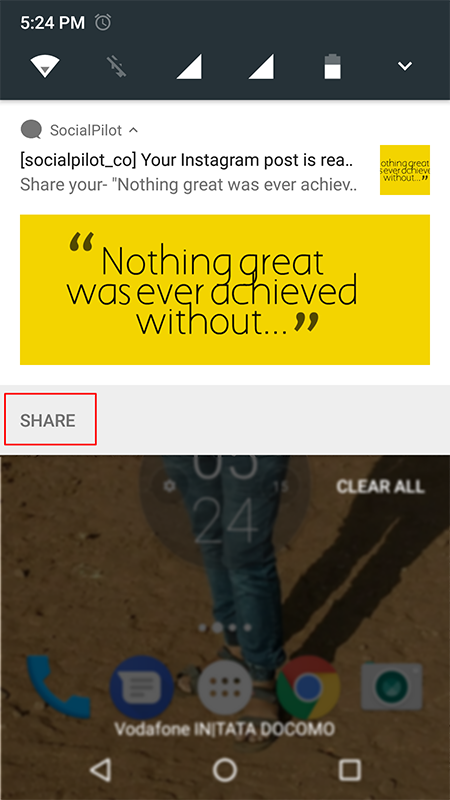 As you receive the push notification on your phone, please click on 'Share' button. You'll be lead to your post in the SocialPilot app. Click on the 'Open in Instagram' button to publish it on your Instagram account. (And that's why you need to ensure that you are logged into the correct Instagram account beforehand). As you click on the 'Open in Instagram' button, a pop-up window will appear asking you whether you selected the right account. Click on the 'YES, I AM' button. As soon as you do that, the post description will be copied to the clipboard automatically. 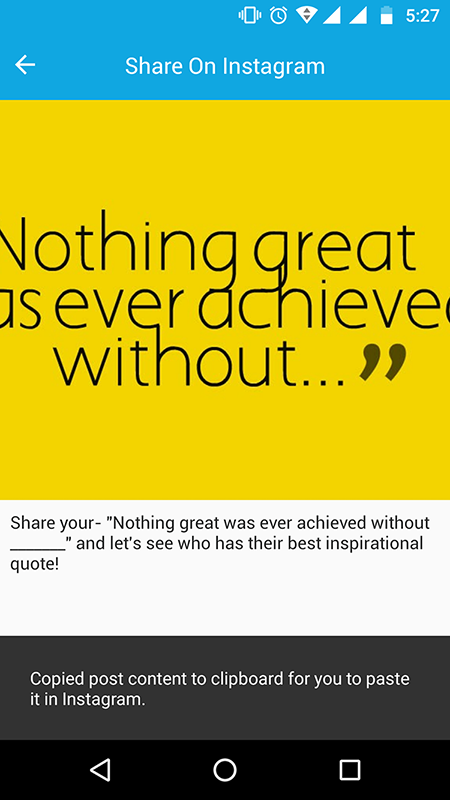 Note: The post content is not automatically displayed in the caption area on your Instagram account. So, we copy your post content to the clipboard and then use the paste button to get the content into the caption area. Now, you will be led to your Instagram account where you can edit your image with the Instagram image editor (if you wish to) and click on the 'Next' arrow in the top right corner. Remember, we copied your post description to the clipboard? Press in the caption text box for long and select 'Paste' from the pop-up. Your post content will be pasted. 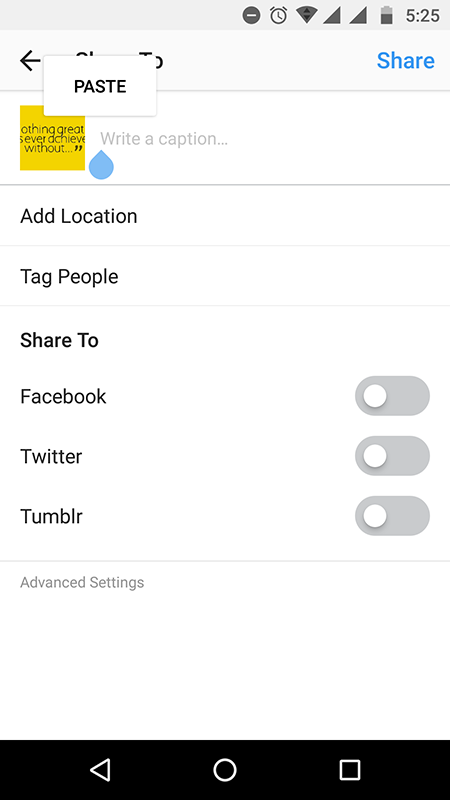 Click on the 'Share' button to share your scheduled Instagram post. 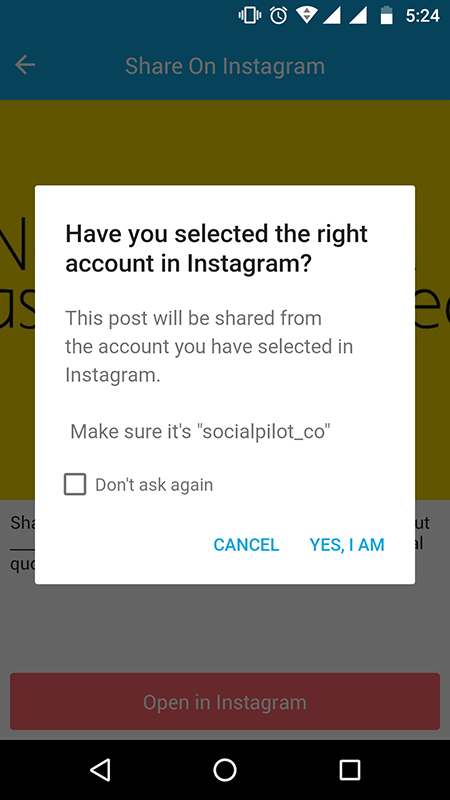 You have successfully shared your post on Instagram with SocialPilot's Instagram scheduling. Note: If you miss the push notification, or you have cleared your notification tab by mistake, don't worry. 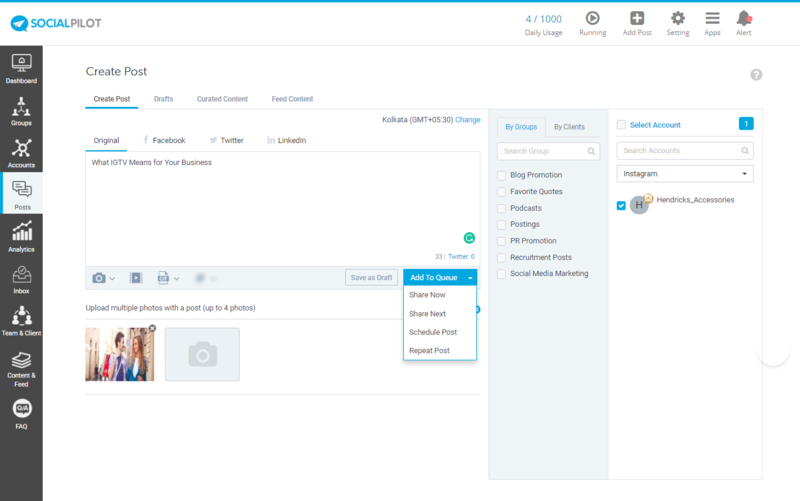 You'll have the post ready in your SocialPilot App. Click on the sidebar and tap on 'Insta Notifications'. You'll find that push notification post under the 'Insta Scheduled Posts' tab and click on 'Share on Instagram' button to share your post.